What about the apparent contradictions the shroud has with Gospel accounts? According to John, Jesus had no bone broken, what would allegedly be a prophecy fulfillment. 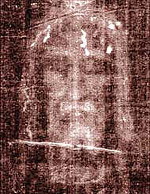 The man of the shroud, on the other hand, according to scientific analysis, has a broken nose. Also, the Gospel of John explictly states Jesus had a kind of “napkin” covering his head, and the rest of his body was involt in linen stripes. This does not match the Shroud of Turin.